CBS TELEVISION FIRST AIRED A Charlie Brown Christmas on December 9, 1965, creating an instant seasonal classic. It got its first tenuous viewing despite the network suits’ fears that the modest little story, voiced by children(! ), sporting a jazz soundtrack(!) and gently suggesting that the holiday may be about more than greed and glitz, would lay a giant Yuletide egg. They needn’t have worried, as it turned ou. The show nobody wanted became the tradition without which no Christmas could be thought to be complete. One of the show’s main plot points involves Charlie Brown’s fear that the holiday has been hijacked by hucksters, so much so that the hottest selling Christmas trees in his neighborhood are not verdant firs but pastel-painted, neon monstrosities. There was a lot of that nonsense going on in those days. The photograph you see here was taken just days after that first airing of ACBC, but I can’t really claim to be channeling its energy or trying to echo its sentiments. The picture isn’t so much a comment on commercialism (nothing that formal) so much as it is a question. 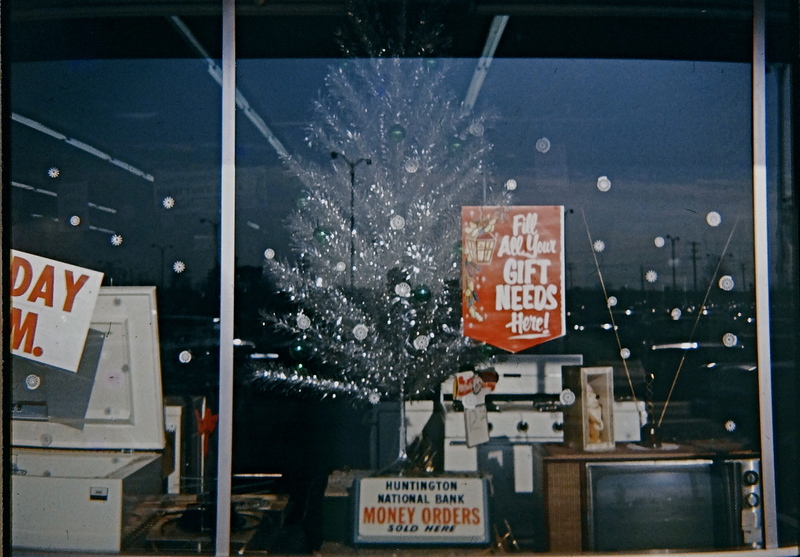 I was a very young thirteen in December 1965, and had only wielded my Imperial Mark XII box camera on a few occasions prior to the day I found myself wandering around Northern Lights shopping center in Columbus, Ohio, specifically past the display window of the Cussins & Fern Hardware Company. Like Charlie Brown, I thought that some holiday novelties, like the recently introduced aluminum Xmas trees were odd, even though I liked the included rotating wheels that projected ever-changing colors onto the silvery sticks in a kind of robotically cold imitation of gaiety. However, unlike Charlie Brown, I don’t think I regarded these abstract Future Trees as an affront to decency. I just thought they were weird. I do remember thinking that the window showed a Christmas that was just kind of……off, a Christmas in which you got a whole television set or a food freezer as a present, a Christmas filled with Strange Trees From The Future, a Christmas where you could always buy….money orders? I knew, in that era, next to nothing about how to formally frame a shot or a visual commentary. I didn’t have the pictorial vocabulary to make an argument. I couldn’t interpret. I just pointed at things that interested me and trusted those things to carry their own narrative weight. I was point-and-shoot before point-and-shoot wiz cool. This Christmas, both the holiday and I are still in flux. I continue to point my camera at shop windows, and continue to wonder what the whole mad mix of beauty and banality means. I still don’t have the answer. Alas, as a photographer, you often have to be content with merely learning better ways to ask the question. Now, if I can just find someplace to buy Uncle Ed that money order he asked for….. This entry was posted on December 22, 2017 by Michael Perkins. It was filed under Americana, Christmas, Commentary and was tagged with Holiday photography, Techniques and Styles.